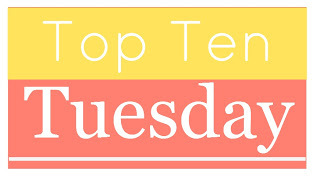 This Top Ten Tuesday is all about music. Sometimes you read a book and think of just the perfect song to go with the story. Or the other way around: sometimes you hear a song on the radio and you are just immediately reminded of a book you read. So this is my top ten books I’d give theme songs to. Though I have to be honest: I’m a bit musically uninspired at the moment, so that’s why this list has 3 times the same artist. Any new music tips are always welcome! Why? I think this song perfectly describes Celaena’s complete and utter badassness. At the start of the Throne of Glass series she has been betrayed and captured, practically waiting for death as a slave in the salt mines of Endovier for a year. But she didn’t become a badass assassin by giving up easily, so count on her to get out and make an epic comeback. Why? This is a roadtrip book and Andrew McMahon’s music is the perfect inspirational roadtripping, daydreaming, stargazing, finding-yourself soundtrack. The book even includes ready-made playlists that include Jack’s Mannequin, though another song. But I think this one fits just as well. Why? Because I feel this song really embodies Juliette’s journey. At the beginning of Shatter Me she’s been locked up for a long time. Because of this isolation and because of what she has done, she’s just going a bit crazy and she feels paralyzed. But it’s also making her stronger to fight a little longer! A movie in black and white. When will it end? and I can’t escape from the prison I’m living in. They keep on telling me to give in. Why? Lola has the habit of talking to the moon when she is feeling a bit troubled. This song is literally called ‘Talking to the Moon’. Why? Heir of Fire is a big game changer in the story of Celaena Sardothien. It’s where she really starts to accept who she is and starts fighting for a worthy cause. Why? I chose Catching Fire but this song fits pretty much any dystopian with a corrupt government where a rebellion is finally growing. Why? To me, Paper Towns was never a romance but a story about growing up and friendship and how you should treasure those friendships and this song has always reminded me of exactly that. and eventually you’ll finally get it right. Why? This is a good soundtrack for Elena Michaels, the only female werewolf in the world, and I think it perfectly describes both her struggle with herself and her relationship with Clay. Why? A Court of Thorns and Roses is a Beauty and the Beast retelling and I kind of ran out of inspiration. What are some of the book you’d give a theme song to? And do you have any tips for new music I might like? I’m currently reading the Throne of Glass series and loving it so much. I’ll have to listen to that song while reading!